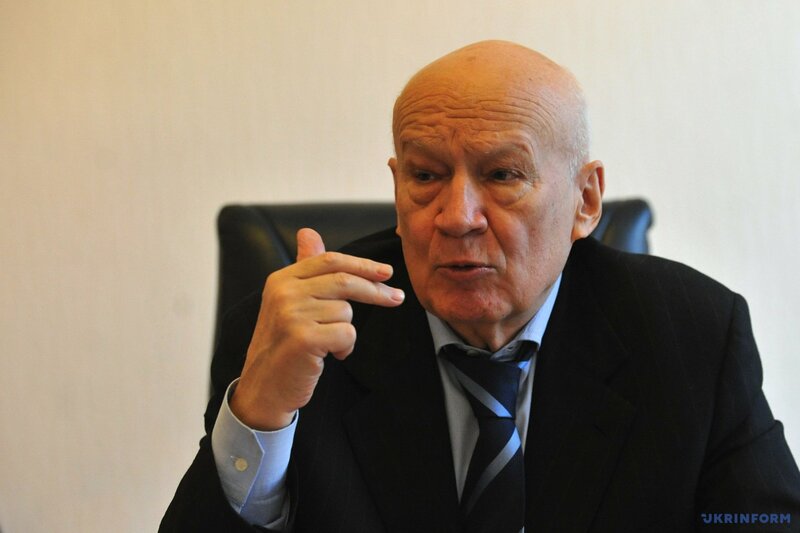 Volodymyr Horbulin, Director of the National Institute for Strategic Studies, twice served as Director of the National Security and Defense Council of Ukraine and one of the first founders of the National Security and Defense Council, rarely gives speeches in public. But his interim or final assessments, analysis and synthesis are always at the forefront of attention of authorities, as well as experts and journalists. Recently, the book "Global Hybrid War: Ukrainian Front” has been published under his editorship at the National Institute for Strategic Studies. The book includes history, theory, philosophy, analytics and suggestions on what should we do on the Ukrainian front. Ukrinform met with Volodymyr Pavlovych and asked him several questions. - I’d like to congratulate you on the publication of such a huge work. - Who are main readers – are they western scientists or diplomats? What good will it do for a Ukrainian general, a Ukrainian official? - Not being too modest, this book gives an opportunity for scientists, military personnel and officials to work with it. And we will look for an opportunity to translate this book into English, because it reveals the picture of today's world in the most (so to speak) explicit forms and with all the historical drama expressed on our unique experience. Therefore, our task is to translate it so that to send it to our embassies around Europe and, of course, to North America. And with regard to how this book can be interesting to our readers in Ukraine ... I think that students of the Institute of International Relations, the Diplomatic Academy, and all those who are involved in the issues of national security can find the answer to one question. What is the formula of today’s peace in terms of security in general, and what is the formula for individual countries, first of all, for Ukraine and Russia? There will be a lot of answers, they could be found in any perspectives – it also applies to the military and political, and economic, and social, and humanitarian spheres. - You write that Ukraine should get used to living in a hybrid world, but not only in the conditions of a hybrid war and that the whole world is becoming a hybrid. Specify please, what it means to "live in a hybrid world": should we start to lie, not fulfill promises, and use manipulations? - What happened to us? Of course, the war did not begin in 2013, although 2013-2014 can be considered as its initial coordinates. Prior to this, everybody already lived in the chaotic world, if once it was a double pole, then after the Soviet Union collapse, it became unipolar. At the beginning of this century in the middle of the first decade, the world started becoming more and more multipolar, however, it started to lose, I would say, certain basic achievements of both world and regional security. And they were the restraint principles and ensured a certain order. What happened in 2013 and 2014 brought us all closer to the horizon, beyond which the world became almost unmanageable, when the entire architecture of global security was destroyed, and many laws provided for the rule of law were violated. All these were destroyed by actions of the Russian Federation. A hybrid war as such appeared not in 2014. Its certain manifestations had been earlier observed in different countries, in different conflicts. But the world has not known before such a concentration of all military and non-military aspects of the hybrid war that fell upon Ukraine in 2014, as well as it has not known before such a flagrant violation of elementary norms of civilized life on our globe. Certain tools of hybrid aggression have been already used by Russia against Ukraine: it is economic pressure, as well as information. I would say it is merciless exploitation of opportunities of an open information space with regard to our people. But when the military intervention in Ukraine began, all the available arsenal of a hybrid war was involved openly. We have long lived in the conditions of a hybrid war, but we’ve never felt the fact that the whole world is in a web of hybrid war elements, which is being weaved against us. - One of the sections of your book is devoted to cultural diplomacy, what vulnerability do our soft power and our cultural diplomacy still have? - I think that in this respect we are always late. What happened in Holland at the referendum on the approval of the Association Agreement between the European Union and Ukraine? In fact, we failed, although through diplomatic channels we knew about the threats of negative result. And we by no means used cultural diplomacy as the main tool that could have changed the point of view of the Dutch people. And I think that these are not we, but first of all the Foreign Ministry that underestimates the role of the cultural expansion of Ukraine's image in western countries. For example, I’m concerned that only the Klitschko brothers and Andriy Shevchenko are known. And broad layers of contemporary culture have no access to the international arena. - In your opinion, do our local victories have only the humanitarian and informational dimension? - Of course not. There are military and political progress. Perhaps, I have the right to say this as I’m clearly aware of the state of our armed forces, our defense industry and the readiness of both security forces and intelligence agencies almost since 1994 and till the present day. And we have never observed such a disappointing situation for 25 years as in 2013 and at the beginning of 2014. Never. We’ve managed to restore a lot, I give credit to the leadership of the country and to our society. This is for the first time since the society and the government have found a common ground and actually restored the army almost from scratch. Our factories of the defense industry, which before the collapse of the Soviet Union had produced military equipment of the highest performance characteristics in the world, started operating again. And it’s only the beginning. But we already have a platform for future perspective. It is the most difficult, a huge step forward. We managed to do some things in the field of cyber security and the National Institute for Strategic Studies was a launching platform for this initiative. - I would clarify that when you came to the National Security and Defense Council for the first time, you warned that for the intelligence and for the army, hypothetical enemies had to be changed, because the Russian Federation would never fully accept our independence. - Surely. Because our military districts were formed in such a way: to confront Poland, Slovakia, Hungary, and the southern - to confront Romania and Turkey. And more than 1,400 kilometers of the north-eastern border was absolutely open. - Tell me please, your book ends before the coming to power of Trump. And some analysts say that all these constructions will not be viable because Trump himself could undermine all the rules and regulations. - I belong to a very small cohort of people who were convinced that Trump would win. But he cannot be compared with Reagan because Reagan had a very distinct program, and he had a very strong team. Assuming changes in the building of relations between the United States and Russia, I don’t think that there will be a new triangle - the United States, China and Russia. I have rather slim faith in this. In this triangle, the hypotenuse and the sides simply will not coincide. But serious tactical steps may be taken, which will be dangerous for Ukraine. These are sanctions, or rather the question of their abolition. Sanctions of the United States are not so important for Russia, as the EU sanctions are. But because of the sanctions, the European Union itself incurs huge losses (as far as I know in the year 2015, they amounted to about EUR 100 billion.). And if the United States and then Europe, having followed the US example, lift the sanctions, it will strengthen Russia. This does not mean that Russia will immediately afford itself to start a major war with Ukraine, but its positions will be reinforced. Trump is a man who will always look for advantages for the United States. But the United States and Russia inherently cannot be allies! Partners - yes, but not allies! - There is a myth that the lend-lease is an American canned stewed meat given to our people almost at the beginning of May 1945. - It is a complete nonsense. Because in 1943, I with my family moved to Horlivka, my father was a construction electrician. When “Studebaker" [an American truck] arrived to his department, it was a joy for many who lived and worked in Horlivka. All boys ran to look at the "Studebaker", tried to climb into the truck... It still makes me smile. - Let's return to the book. At one point, you say that a total victory in a hybrid war is impossible. At another point, the winner turned out to be the one who managed to convince the world of this. So nevertheless, what about the probability of victory? - Now I’ll try to ground this thesis. A hybrid war actually is infinite. It is possible to achieve some success; however, it is impossible to win. There is no guarantee that we will, for example, again enter into a serious confrontation with the Russian Federation on the "gas issue". As far back as on January 6, 2006, when there was the first gas cutoff, at the request of Viktor Yushchenko I gave a news conference at the Presidential Administration. And I said that this was only the beginning and that apart from the gas war, we would also have milk, cheese, sausage, candy and other wars. We must be prepared for this. I can’t say that I was heard. Tools of a hybrid war became multifaceted and it’s impossible to fully stop it, or win it. However, we need to work with the causes that led to it, and resist the goals that the enemy seeks to achieve. - In the book, you clearly gave the objectives pursued by the Russian Federation. Federalization, the change of our course and the official status of the Russian language. If we want to prevent the latter, would it be right to approve the law on the Ukrainian language in its latest version? - I've got a palliative position on this issue. In 1993, I returned from Moscow as Head of the National Space Agency. Ivan Drach and Pavlychko were with me in the car. Most of the time, I listened to them. As a man with a technical degree, I respect the coryphaeus of literature. Their position: the official language should be one - is the basis of national self-determination, but we should be very careful when solving the "language issue". And it is not only the task of the Culture Ministry and the Information Policy Ministry. It is the task of the Ukrainian intelligentsia. Fold your arms around the Ukrainian intelligentsia and Ukrainian science, and gently go the next stage of Ukrainization. - One phrase stayed in my memory that our enemy speculates on the classic standards of journalism. - Speaking of journalism. Ukraine needs a militant, but not a hostile journalism. Today like never before it is in the power of journalism to construct a small, but none the less a bridge between society and government. This must be done. Today it is the first priority issue on the agenda. - Comment on the president’s initiative regarding a referendum on NATO. - Even if it is carried out, it will cause certain debate. It is a serious step, it is the President’s search for a stone wall, from which he would like to build a long-term foreign policy verified with the society. It's a pledge of confidence in the future. In 2004, I conducted a public opinion poll at the National Center for Euro-Atlantic Integration. Supporters of NATO membership totaled about 33 percent, those who were against - also about 33 percent, and another third of doubted. But just within the next two months the situation has changed drastically. Two of the slogans played their role: on the division of Ukrainians to "three-classes" and on the persecution of the Russian language. And the number of undecided people increased to 50%. After 2014, the situation changed again. The number of NATO supporters increased. But we again began to throw destructive constructs about fears of breaking relations with Russia, about a decline in social standards, about worsening of the economic situation ... I think that President understood that again the storm was gathering and made a proposal to hold a referendum. This, of course, is a risk. But I like this risk.